About 20 million people in the United States suffer from temporary or permanent voice impairment. Life can sound like a nightmare, even though we don’t hear our own voice – but we do feel the attention. Then, those are those rare cases which basically render people mute. While there are various medical interventions that can improve one’s voice, it’s still far from the real deal. What these people need is not a patch here and there, but a whole new set of vocal cords, and a group of researchers has set out to grow it in the lab. Starting from a couple of human cells, they’ve grown a critical tissue involved in vocalizing. It’s basically indistinguishable from the real deal (it’s still biological tissue after all) and biocompatible. The vocal folds are twin infoldings of tissue which are (roughly) the size of our eyelids. They are covered with a protective mucosal lining and are located in the larynx, which is the cartilage casing in the throat that is often referred to as the Adam’s Apple” (for men), the “Eve’s Apple” (for women), or the “Voice Box”. Diaphragm action pushes air from the lungs through the vocal folds, producing a periodic train of air pulses. This pulse train is shaped by the resonances of the vocal tract, and since each “voice box” is shaped uniquely so will the voice. Since men have an Adam’s Apple, their voice is lower since the vocal cords are longer. The basic resonances, called vocal formants, can be changed by the action of the articulators to produce distinguishable voice sounds, like the vowel sounds. In an adult male, the vocal folds are usually 17-23 mm long, and 12.5 -17 mm in an adult female. They may be stretched 3 or 4 mm by action of the muscles in the larynx. The male speaking voice averages about 125 Hz (cycles per second), while the female voice averages about 210 Hz. Children’s voices average over 300 Hz. 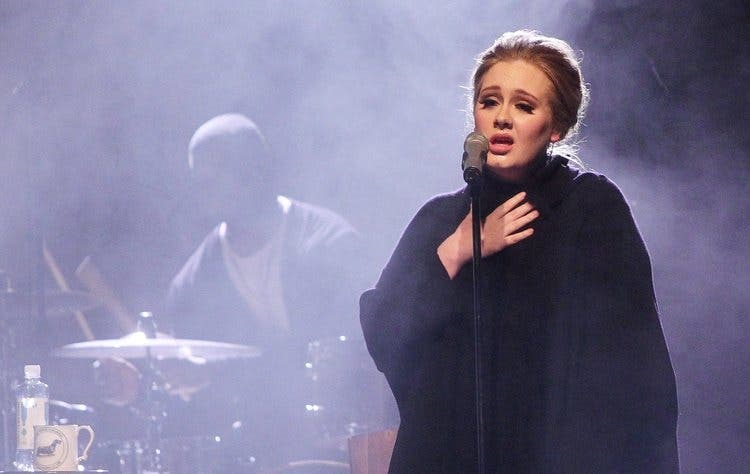 A soprano singing her highest-pitched notes can reach a whooping 1,000 cycles per second! Some people aren’t that lucky, and can barely squeeze 80 cycles per second due to voice impairments like those following surgeries or radiation targeting cancerous growth. The most sensitive is the vocal cord mucosa which can get scarred and stiffened. There some medical procedures that can help, like surgeries or injecting collagen to help the vocal cords come out more easily. Yet people suffering from permanent vocal impairment rarely if never recover their full voice. Hoping to address the millions all over the world with vocal cord issues, Nathan Welham, an associate professor of surgery at the University of Wisconsin School of Medicine and Public Health in Madison, along with colleagues have started growing mucosal lining in the lab. The team collected connective fibroblast cells, which form the main body, and epithelial cells, which line the surface, from the voice boxes of four living humans and a cadaver. Next, the two sets of cells were placed in 3D collagen matrix which mimicked a natural voice cord set. In just two weeks, these replicated and grew into vocal cords. “I remember holding it and thinking, gosh, this feels like the real thing, which has a distinct feel—sort of like Jell-O but stronger and able to return to its shape if you deform it,” Welham told Science Mag. 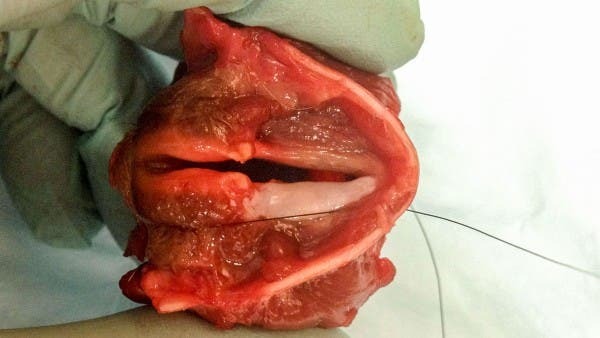 The vocal cord tissue grown in the lab at the University of Wisconsin School of Medicine and Public Health in Madison. The mucosae were put inside the voice boxes of five deceased dogs, while one of the two vocal cords was left as it was. Air was pumped through, then measured acoustically. The implants were found to function nearly as good as the original cords, the researchers reported in Science Translational Medicine. Mice engineered to have human immune system were fitted with the implants. Even after three months, these weren’t rejected by their bodies. So far, so good. Welham and colleagues’ work is truly remarkable. It suggests that patients can grow their mucosal lining in the lab so it’s custom made for them, and out of their own cells so biocompatibility issues are kept to a minimum. It’s harder said than done. Countless tests on animal models are required before clinical trials can begin. It might take a couple of years before voice box implants like these will reach needy patients.